Saw palmetto is a low-growing palm tree that may be most well known as an herbal treatment for an enlarged prostate, according to the National Institutes of Health. The American Cancer Society says saw palmetto is grown in the West Indies and in coastal regions of the southeastern United States. While this herb is generally regarded as beneficial to men, it may have some therapeutic value for women as well. 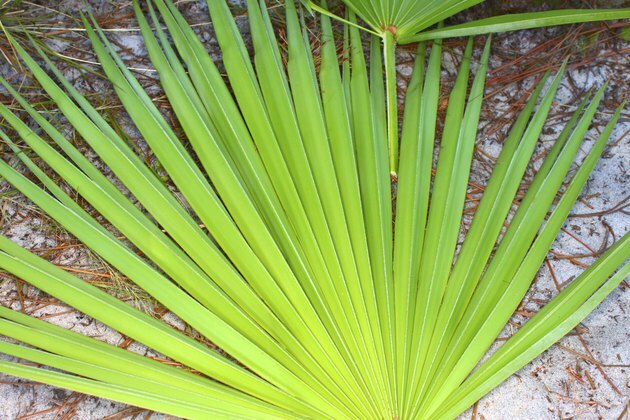 Saw palmetto is available in tablet, capsule, tea and natural berry forms. Herbs are very potent and have the potential to interact with medications. Speak to your doctor before adding any herbal preparations to your daily routine. Saw palmetto may help reverse a condition known as hirsutism, which male-patterned hair growth in women, according to NutritionalSupplementsHealthGuide.com. Hirsutism may be caused by an overabundance of male hormones, especially testosterone. It's theorized that saw palmetto may block the overproduction of testosterone, thus alleviating unwanted hair, says SawPalmettoFacts.com. Saw palmetto is purported to encourage breast enlargement, according to NutritionalSupplementsHealthGuide.com. This supposed benefit is based on the premise that the herb stimulates the production of the female hormone prolactin. Prolactin is a hormone released by the pituitary gland that promotes breast development and milk production in women who are breastfeeding, according to the National Institutes of Health. Saw palmetto's touted ability to increase breast size in women has not been substantiated, according to Saw Palmetto Facts.com. Saw palmetto says may be beneficial in the treatment of bladder disorders such as urinary tract infections, says the National Center for Complementary and Alternative Medicine. NetDoctor.com/UK advises that although saw palmetto is a very good herbal remedy for inflammation of the bladder and painful urination, it is more of a urinary antiseptic than an antibiotic. There is little information available on the effectiveness of saw palmetto for the treatment of bladder-related dysfunctions.